(Photo: REUTERS / Osservatore Romano)Pope Benedict XVI greets U.S. President Barack Obama (R) during their meeting in the pontiff's private library at the Vatican July 10, 2009. 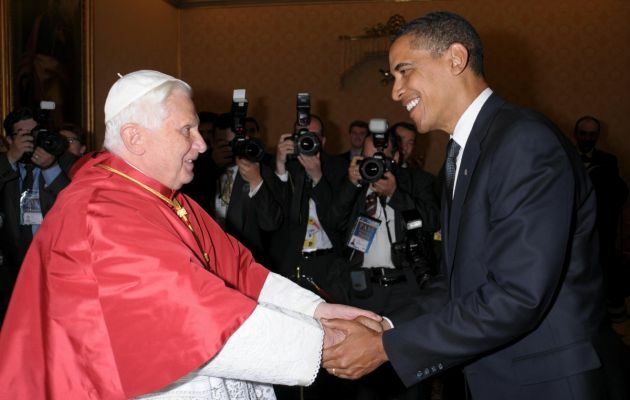 On March 27 this year Obama will meet Pope Francis at the Vatican. WASHINGTON (Reuters) - When President Barack Obama meets with Pope Francis at the Vatican in March the visit will allow the U.S. leader to highlight a shared interest in addressing the gap between rich and poor, the White House has said. Obama, a Democrat, made lifting up the middle class and fighting income inequality in the United States a key priority for his second term and a top campaign theme during his 2012 run for re-election. The president's first meeting with the Pope will give Obama a chance to align himself with a religious leader who has focused on fighting poverty - and who has said the Roman Catholic Church must shake off an obsession with teachings on abortion, contraception and homosexuality. Catholics are an important political constituency for Obama's party as Democrats seek to keep their majority in the U.S. Senate in November congressional elections. Obama supports gay marriage and women's reproductive rights. The Pope's comments on these hot-button social issues met with strong approval from U.S. Roman Catholics, according to a poll released last fall. But it is the Pope's emphasis on helping the disadvantaged that has resonated with Obama. The president has struggled to gain footing in his second term despite support from his base for proposals to raise the minimum wage and reform the tax code to make the wealthy pay more. "The president looks forward to discussing with Pope Francis their shared commitment to fighting poverty and growing inequality," the White House said in a statement on January 21. Obama has heaped compliments on the Pope since he took over from Pope Benedict, a staunch conservative who resigned in February. Obama and first lady Michelle Obama met Pope Benedict at the Vatican in 2009. Pope Francis, who took the helm of the Roman Catholic Church last March, has led an effort to simplify the church and focus on the needy. Known for being frugal, he has appealed to people to help the poor, offered to drive his own car and selected cardinals who signify his concern for poorer nations. In October, Obama pronounced himself "hugely impressed" with the pope's comments on the church and abortion, contraception and homosexuality. Last month, he called the Pope "an extraordinarily thoughtful, and soulful, messenger of peace and justice." Obama is scheduled to meet with the Pope on March 27 in a trip that will include stops in the Netherlands, Belgium and other parts of Italy. The trip also marks Obama's first official visit to two European Union bodies - the European Council and the European Commission - the White House said in a statement. He will be in Brussels on March 26 to meet with presidents of the two institutions. The United States and the 28-nation EU are in talks to form a trade pact. In the Netherlands, Obama will attend the Nuclear Security Summit to discuss progress in securing nuclear materials and efforts to prevent nuclear terrorism with other world leaders, the statement said. The president will also meet with Italian leaders in Rome.